Advertise your product to 7,500 PATH Intl. Instructors and 850 Member Centers. Join PATH Intl. as a Corporate Member. Corporate members receive discounts on advertising in PATH Intl. Strides, exhibiting at the international conference and social media posts. Hurricane Sandy devastated the eastern seaboard of the United States in late October and early November 2012. Unfortunately, the buildings of Staten Island Recreation Association, a PATH Intl. Center in New York, were also completely destroyed. Because of past donations from members, the PATH Intl. Disaster Relief Fund is able to help fund the feed and care of their horses while the center rebuilds this spring. Due to the treacherous weather being forecast to hit the Omaha, NE, area, the hard decision has been made to try to reschedule the PATH Intl. Region 7 conference for September. Safety and well-being are the cornerstones of this association. And those ideals not only apply to your participants, but in this instance they apply to you, the members, who might be driving in dangerous conditions. We apologize greatly for any inconvenience this rescheduling may cause. Upon the decision regarding a rescheduled date, all registrants will be notified and any amendments to the standard cancellation policy will also be addressed at that time. Stay safe and warm! We will get back to everyone ASAP with rescheduling information. Click here for information and guidelines. Now is the time to recognize their efforts and submit an award nomination for these special individuals and animals. Nominations are due no later than 12 midnight, MDT, May 20. Click here for information and for the fillable nomination forms. 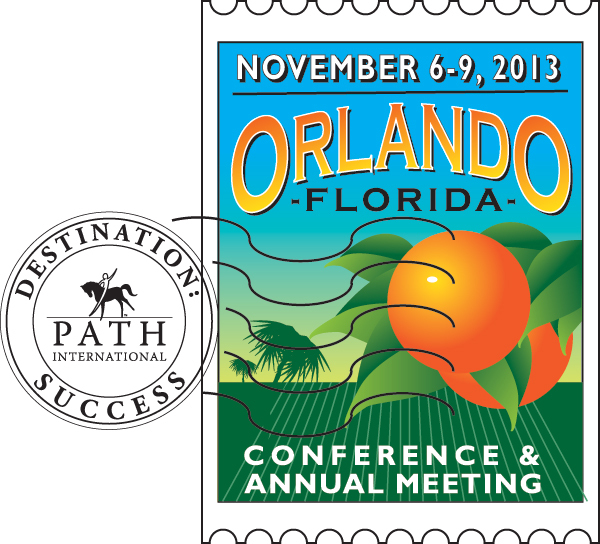 If you are interested in selling your products to nearly 1,000 instructors, executive directors and other decision makers, be an exhibitor at the 2013 PATH Intl. Conference and Annual Meeting. Detailed information on exhibiting in Orlando can be found here. Adaptive sports play an important role in the health, happiness and overall well-being of individuals with disabilities. As a provider of adaptive sports services, PATH Intl. Centers strive to provide safe and effective instruction and coaching for your program participants. Fielding a team of trained staff and volunteers, instructors and coaches is key to the success of your participants and athletes. The Bob Woodruff Foundation has funded a study to examine how adaptive sports programs prepare volunteers and staff, instructors and coaches to meet the needs of students and athletes with disabilities. This survey is being conducted by Northeast Passage at the University of New Hampshire, in collaboration with U.S. Paralympics and Disabled Sports USA. Your participation in this survey is important and will help to develop a complete picture of strengths and areas of need for training within the field of adaptive sports. The results of the survey will be used in summary form. Your individual responses will remain confidential. If you have questions about the survey, email Cara Carr at the University of New Hampshire. A link containing survey results and training opportunities will be disseminated to all study participants in April 2013. This survey will take between 10 and 35 minutes to complete based on the number of adapted sports your program offers. If you complete the survey by February 28, 2013, and supply contact information, you will be entered to win one of five $50 gas cards. Thank you for your participation in this important study. Horses and Humans Research Foundation (HHRF) announces an open call for proposals to investigate the therapeutic effects of horses on humans. HHRF is accepting applications for grants up to $50,000. The Foundation's broad research agenda includes basic research as well as clinical studies that will ultimately impact physical and mental health and quality of life for those engaged in equine-assisted activities and therapies. Deadline for submission proposals is June 15, 2013. If your center has high-school age volunteers who would be interested in volunteering in Thailand, Loop Abroad offers experiential summer programs in Thailand for high school students. Many of the programs feature a week living and working as a volunteer at the Elephant Nature Park. Programs also include a two-week veterinary service program, where students can volunteer alongside a vet, working at a dog rescue and at the elephant sanctuary. Any student who volunteers with Loop Abroad through a PATH Intl. Center will have $500 of their tuition donated to the PATH Intl. Center of their choice. Contact Loop Abroad for information. The American Quarter Horse Foundation announces changes to the America's Horse Cares grant program, which is designed to support the equine-assisted activities and therapies (EAAT) industry. Beginning in 2013, its general program, which helps fund educational grants for PATH Intl., will expand to include educational grant funding for member facilities of the American Hippotherapy Association (AHA), Certified Horsemanship Association (CHA) and the Equine Assisted Growth and Learning Association (EAGALA). The deadline for applications is March 1, 2013. For a complete list of the program criteria and approved curriculum, please visit AQHA's website. PATH Intl. welcomes these centers who joined in January 2013.
and keeping them happy and sound can be a full time job. The horses in the equine-assisted activities and therapies industry are usually older and have a stressful, yet rewarding, job. At the facility where I work, we are always looking for ways to keep our horses happy and comfortable so they don't suffer from burn out. In the past three years that I have been the equine coordinator at a facility of more than 30 horses, we have tried many different techniques--chiropractic care, massage therapy, acupuncture--but the most successful treatment so far has been light therapy. Read more. The PATH Intl. Equine Welfare Committee encourages positive and engaging educational exploration from our readers; we'd love to hear your feedback! Let us know if you have any questions about our tip or have a suggestion about specific topics you would like covered in the future. Email Kristin Mason, EWC chair. Thank you! Participate in lively, thought-provoking and sometimes controversial discussions in the PATH Intl. Equine Welfare Community. No matter your specific interest (EFP, therapeutic riding, hippotherapy, carriage driving, interactive vaulting, etc. ), they ALL involve partnering with equines. Exchange ideas, ask questions, offer comments and suggestions, and "pick the brains" of some of our industry's most experienced and qualified people. Access the forum through the PATH Intl. website by clicking on the Community Connections button in the left menu. If you have any questions about joining the PATH Intl. Equine Welfare Community, please email Moderator Patty D'Andrea. Congratulations to Bitterroot Therapeutic Riding, a PATH Intl. Center in Corvallis, MT, which was featured in the December/January 2013 issue of Ranch & Reata Magazine, The Journal of the American West. To apply, please complete a volunteer application form. Return application and resume to Corey Campbell or call her at (800) 369-7433, ext. 104. No matter what questions you might have, there are experts who are willing to help you find the answers. Do you have questions about what to expect on an accreditation site visit? Are you unsure how to interpret a specific standard? Do you want to find out how your center can comply with the standards? Ask the experts! The PATH Intl. Accreditation Subcommittee and your fellow PATH Intl. Members are on Community Connections to answer your questions. Log in to PATH Intl. Community Connections, join the Standards & Accreditation community and receive expert advice.